When your countertop has sustained damage over the years and become unappealing to the eyes, there is no better Corian® countertop repair in Mesa than the professionals at AZ Countertop Repair & Refinishing. Dedicated to providing the highest quality customer service and top notch Corian® countertop repair and refinishing, AZ Countertop has over 30 years of experience and five star reviews on Google and Yelp. We also provide other excellent services including countertop refinishing, and sink replacement, giving your kitchen that updated and beautiful look that you have always wanted. Trust the professionals at AZ Countertop to repair your Corian® countertop in Mesa, and bring beauty and luxury back into your kitchen countertop. One of the reasons that Corian® countertops are so popular in Mesa and throughout the country is that they are durable. The solid surface countertop is not porous, so it doesn’t soak up stains quite as readily as other counter types. Though Corian® countertops are resistant to common damages, they are not immune from them. If you are not careful while you are preparing foods, you can easily gouge the countertops. Drop a heavy enough object on the counters, and you could get a chip or a deep crack. A stove top fire could put out enough heat to damage the nearby countertop surface. Whatever the reason for the damage, you don’t have to resign yourself to investing in new countertops. 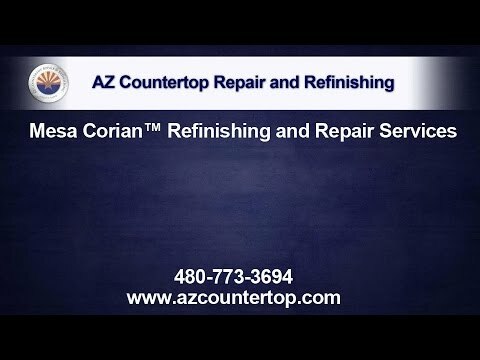 The experienced professionals at AZ Countertop Repair & Refinishing have the skills and the tools to make any Corian® countertop repair. We will restore the structural integrity of your Corian® countertops and seamlessly blend the repairs, making your counters look as good as the day they were first installed. We’ll color match the repairs so well that you won’t be able to identify where the damage was. As your countertop becomes dull over time, you may need to consider countertop refinishing services by AZ Countertop! For the best countertop crack repair services in Mesa, come to AZ Countertop and we will make your Corian® countertop look brand new! Your sink is an important part of your kitchen, so to get the best sink replacement and installation services, come to AZ Countertop! Richard Kaiser has 30 years of experience installing and repairing countertops of all types, and has the skill to make both large and small repairs and to get the results you need. We are dedicated to exceeding our customers’ expectations and to helping them save money by avoiding Corian® countertop replacement. Call us today to discuss your needs for Corian® countertop repair in Mesa and to learn more about our company and our services. No job is too small or too large. We’ll evaluate the damage to your Corian® countertops and let you know just how we can help you restore them to their former glory.